Basics and implementation of capacitive proximity sensing part I, Sept. 11, 2008. Basics and implementation of capacitive proximity sensing part II, Sept. 09, 2008. Adding proximity sensing to your next embedded design, Aug. 13, 2008. Product feature: digital touch goes capacitive, Jul. 14, 2008. It is now common for even relatively mundane devices, such as an electric drill or a vacuum cleaner, to use a programmable device for its control algorithms, but the same level of sophistication has yet to migrate to the user interface. Where there could now be a touch panel display and solid state relay, it is still more common to find conventional LEDs and discrete switches. 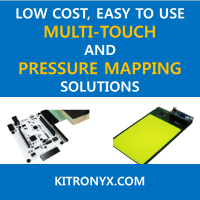 Practical considerations for capacitive touch screen system design part I, Jul. 28, 2008. Practical considerations for capacitive touch screen system design part II, Jul. 30, 2008.